The San Diego County Democratic Party Thursday announced its support of Measure G, commonly known as the SDSU West initiative. The party’s governing body, the Central Committee, voted 40-9 in support of the ballot measure to join a list of supporters that includes City Council members Barbara Bry and Lorie Zapf, the Sierra Club and the San Diego Regional Chamber of Commerce. The party also voted against supporting Measure E, otherwise known as SoccerCity. Both initiatives appear on the November ballot. The SDCDP represents roughly 550,000 voters in San Diego County. The Central Committee is composed of Democrats elected by voters in each Assembly district in the county. The SDCDP is the country’s fifth-largest Democrat organization. 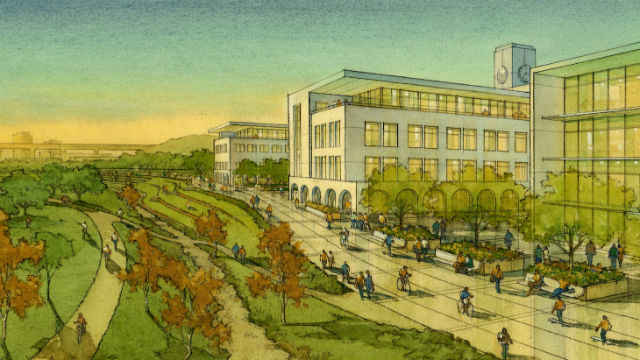 SDSU West, backed by the Friends of SDSU alumni group, is a plan to redevelop the SDCCU Stadium site in San Diego’s Mission Valley into a 35,000- seat football stadium, commercial and residential space, a river park and a new SDSU academic campus. The competing SoccerCity plan, which is backed by Mayor Kevin Faulconer and Councilman Scott Sherman, includes a 23,500-seat multi-use stadium for Aztec football and soccer, commercial and residential space, a river park and an SDSU campus extension. SoccerCity has drawn support from former Olympic soccer players Landon Donovan and Shannon MacMillan and is being funded by FS Investors, a La Jolla-based investment firm.